The aptly named Helmet of Justice is a video camera-equipped brain bucket that can record evidence onto a USB drive in case of a crash. Developed by software developers from Chaotic Moon, the ‘black box’ bicycle helmet was designed to help cyclists figure out what happened if they got hit by a car and prove fault if need be. The Austin firm developed the 360 degree video helmet after one of their own employees fell victim to a hit and run while riding his bike. Drivers beware – the Helmet of Justice is on the case! Chaotic Moon designer, John Poindexter was hit by a car while riding his bike and was knocked out. The car ran without helping him and Poindexter was left in a daze and didn’t even remember what happened, let alone enough details to make an accusation. Many cyclists these days have resorted to wearing head cams to have recorded evidence in case they are hit, but these cameras are bulky and one extra thing you have to remember to bring and to turn on. Chaotic Moon set out to solve this problem by incorporating cameras into the helmet. The Helmet of Justice features seven mini-cameras located in the vents of the helmet and held in place with foam. The cameras take video at 30 frames per second with a resolution of 720×480 in 360 degrees. When an accident happends, the cameras turn on and up to 2 hrs of video is saved to a removable USB drive in the helmet, which can be taken out and plugged into a computer to see what happened. Future iterations are expected to have higher resolution cameras and sensors that can turn on cameras before the accident happens. 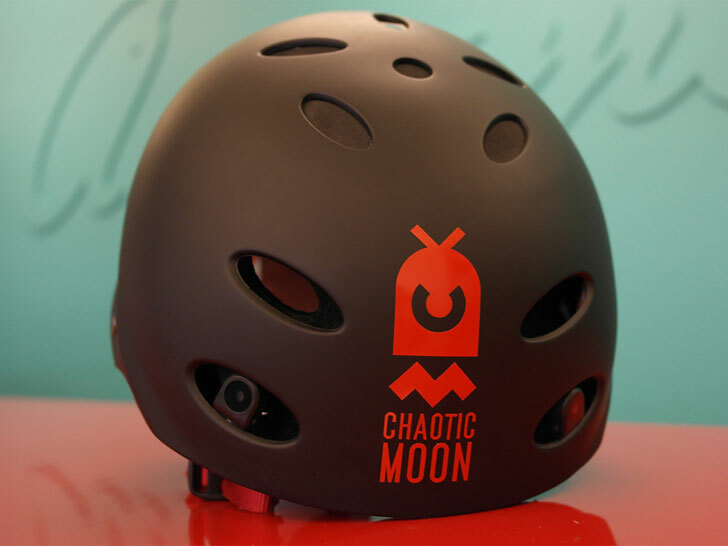 So far, Chaotic Moon isn’t mass producing these and a one-off helmet costs $300, but they are in talks with major helmet manufacturers to license their design and software. The aptly named Helmet of Justice is a video camera-equipped brain bucket that can record evidence onto a USB drive in case of a crash. Developed by software developers from Chaotic Moon, the 'black box' bicycle helmet was designed to help cyclists figure out what happened if they got hit by a car and prove fault if need be. The Austin firm developed the 360 degree video helmet after one of their own employees fell victim to a hit and run while riding his bike. Drivers beware - the Helmet of Justice is on the case!